Although H2O MODELLE are not a household word in 1:1250 collector circles, I should tell you that I just got a new, very nice model of HERTHA (H2O No. 13). This little ship (6.5 cm/2.5 in. LOA) is a member of the genre of German “Seebäderdampfer” (beach resort steamers) that transport summer vacationers to such islands as Helgoland, Sylt, Hiddensee and Rügen. HERTHA (1938, Bräunlich Steamship Line) is a typical example of these little steamers (now replaced by very modern vessels). In the 1920/30 years, my grandparents and their children regularly left Berlin by train and boarded a ship such as HERTHA in Stettin to spend their summers on an island by the sea. 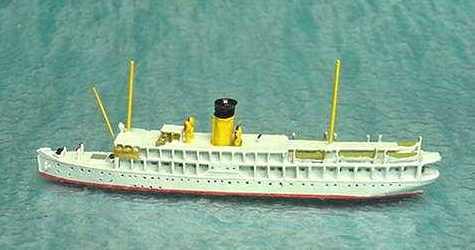 Wiking already made models of such ships (e.g., COBRA) in the 1930’s, and the new H2O steamer model is a fine example of the resort steamers that operated in the East (Baltic) and North Seas in those times. This is my first encounter with H2O models, and I recommend them highly; HERTHA is up to the present standards of model manufacture such as CM.